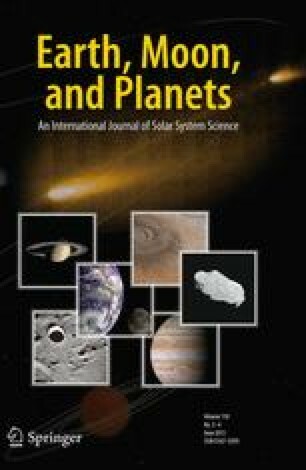 This paper reports on the detection of a satellite around the principal nucleus of comet Hale-Bopp. As shown elsewhere, a successful morphological model for the comet's dust coma necessitates the postulation of overlapping jet activity from a comet pair. The satellite has been detected digitally on images taken with the Hubble Space Telescope's Wide Field Planetary Camera 2 in the planetary mode on five days in May–October 1996. An average satellite-to-primary signal ratio is 0.21 ± 0.03, which implies that the satellite is ∼30 km in diameter, assuming the main nucleus is ∼70 km across. To avoid collision, the separation distance must exceed 50–60 km at all times. The satellite's projected distances on the images vary from 160 to 210 km, or 0.06 to 0.10 arcsec. The satellite was not detected in October 1995, presumably because of its subpixel separation from the primary. The radius of the gravitational sphere of action of the principal nucleus 70 km in diameter is 370–540 km at perihelion, increasing linearly with the Sun's distance: the satellite appears to be in a fairly stable orbit. Its orbital period at ∼180 km is expected to be ∼2–3 days, much shorter than the intervals between the HST observations. If the main nucleus should be no more than 42 km across, Weaver et al. 's upper limit, the satellite's orbit could become unstable, with the object drifting away from the main nucleus after perihelion. Potentially relevant ground-based detections of close companions are reported. Efforts to determine the satellite's orbit and the total mass of the system will get under way in the near future.